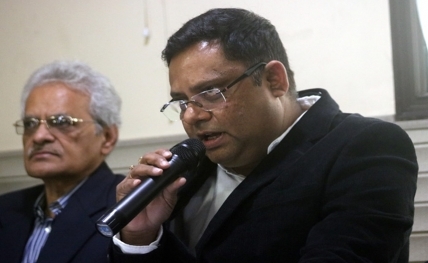 New Delhi, Feb 12 : Members of the Film Federation of India (FFI) here on Tuesday urged the government to pay attention to issues ailing the film industry and sought creation of "special courts" for the industry. "The government decision of including an anti-camcording provision in the Cinematography Act to control piracy will need serious implementation," FFI’s Vice-President Ramesh Tekwani told IANS. According to FFI President Firdausul Hasan, piracy of Indian films has crossed borders. "In Bangladesh, people watch our films, but they are not getting released there. This is piracy. Being a part of the FFI, we can just raise our voice, it’s the government who has to do the real job," he said. "To maintain better relations, we are creating an Indo-Bangla federation. Without the the government’s help, we won’t be able to do it. The government’s co-operation is very important," Hasan said.